Cape Town - Entrepreneurs, think not only about what you would like to achieve for yourself, but also what you would like to achieve for our nation. 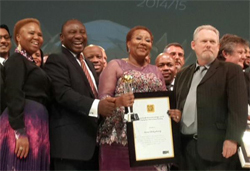 That is according to Deputy President Cyril Ramaphosa, who gave the keynote speech at the third annual SA Premier Business Awards at the Sandton Convention Centre on Thursday evening. "As you build your businesses, please consider how they can contribute to building social cohesion," he said. "Enterprise is not just an economic good. It is also a social good. "Business is not solely about profits," he said. "It is also about serving a broader purpose." Ramaphosa said government would continue to strive to make it easier for companies to grow, to invest and to create more decent jobs for South Africans. "Our economy needs to grow at a faster rate to create jobs and eliminate poverty," he said. He said the strong growth South Africa experienced in the mid-2000s - which was fuelled by the global commodity "super-cycle" - concealed deep structural problems in our economy. "This was evident in the declining contribution to GDP of productive sectors and under-investment in economic infrastructure," he said. "The National Development Plan outlines a long-term vision for South Africa that includes growing a more competitive and diversified economy. "The Industrial Policy Action Plan, the New Growth Path and the National Infrastructure Plan all contribute to the realisation of this vision." During the last financial year, Ramaphosa said, 236 enterprises were approved for funding under the Manufacturing Competitiveness Enhancement Programme, with a total grant value of R1bn. The investment leveraged R3.7bn in support of 28 000 jobs. He said the Industrial Policy Action Plan (IPAP), a three-year rolling plan which would be launching its next stage in the next few weeks, identifies new opportunities and introduces support measures to grow prioritised sectors. "It focuses on the potential of Special Economic Zones to advance regional industrialisation by clustering manufacturers that add value and enhance employment," he said. Achievements have been recorded in strategic sectors such as the automotive industry. Nearly R14bn has been invested in new automotive and components plants since 2009 supporting more than 56 000 jobs, said Ramaphosa. "We are equally pleased with the impact of our interventions in agri-processing and biofuels, capital equipment, plastics, pharmaceuticals and cosmetics, clothing and textiles, and business process services." Procuring South African-manufactured products remains crucial to creating and sustaining jobs, said Ramaphosa. "This is why we encourage all South Africans to rally behind the work of Proudly South African and the Buy Back South Africa campaign," he said. The South African Premier Business Awards celebrate companies that invest in human and technical capabilities, and that produce quality products and services. It runs in partnership with the Department of Trade and Industry, Brand SA and Proudly SA.